At the Convent of Sweet Mercy young girls are raised to be killers. In a few the old blood show, gifting talents rarely seen since the tribes beached their ships on Abeth. Sweet Mercy hones its novices’ skills to deadly effect: it takes ten years to educate a Red Sister in the ways of blade and fist. 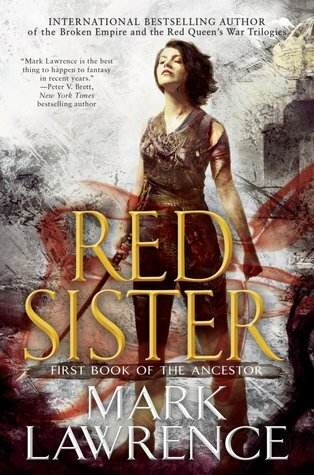 And so starts Red Sister–my first book by Mark Lawrence. What a fantastic debut it is! I have many of his books in my TBR list, and I’m slowly chipping away at them. Red Sister is a book that came highly recommended to me by a friend, and I must admit I’m so happy I decided to read it. The book starts with Nona at age eight and about to be hanged. She is saved at the last minute by a nun from the Convent of Sweet Mercy, a convent known to train chosen girls to be assassins. Most of the book is about the training, the fantastic fights, and the friendships that develop. Part coming-of-age, part YA fantasy I loved the way Lawrence created this world. His narrative is detailed, and he does a phenomenal job at developing his characters, especially the protagonist Nona. This fast-paced, page-turner was a great introduction to the world of Mark Lawrence, and I look forward to reading the next books in this series.